Mobile AE provides comprehensive AE calculations, AE assessments and AE Comms letters, as well as AE contribution submissions to a range of pension providers via an App for mobile devices. Provides comprehensive AE calculations, Assessments and Comms letters over an App on any mobile device. Once you download the aeExchange App you can use it straightaway without needing to sign up to create an account in advance. It will calculate the AE pension amount due, conduct AE assessments and further provide you with TPR compliant AE Comms letters which are based on TPR's provided templates. You can print and/or email the AE Comms letters. This has all the features that Quick AE provides and in addition enables you to sign up to create an account in advance. All the data entered under your account will be saved and can be re-used for multiple employees. Full AE also allows you to submit your AE data to pension providers. This web based version of Quick AE is a replica of the mobile AE App. It provides comprehensive AE calculations, assessments and Comms letters as described in the mobile version. The only difference being that this version runs on commonly used browsers on your desktop. 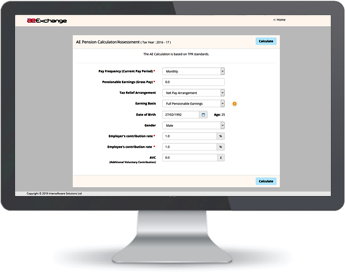 This is a comprehensive web based aeExchange AE service. It allows pay bureau, employers and pension providers to process their AE functions in batch. For more details please refer to How Does aeExchange Work?.